A father has been found guilty of killing his daughter in what police have described as an honour killing. The body of Banaz Mahmod, 20, was found in a suitcase buried in a garden in Birmingham last year. Her father Mahmod Mahmod, 52, and uncle Ari Mahmod, 50, from Mitcham, south London, were both convicted of murder at the Old Bailey. A third defendant, Darbad Mares-Rasull, was cleared of conspiracy to pervert the course of justice. Ari Mahmod was also found guilty of conspiracy to pervert the course of justice. Mohamad Hama, 30, of West Norwood, south London, an associate of Ari, has pleaded guilty to the murder. Miss Mahmod was killed after falling in love with a man her family did not want her to marry. Her father and uncle ordered the murder because they believed she had shamed the family, the three-month trial heard. Banaz had made several attempts to warn police that her life was in danger, even naming those she thought would kill her. In footage recorded following an earlier attempt on her life by her father in December 2005, she said she was "really scared". However her statement following the assault was allegedly not taken seriously enough by investigating officers. Several officers are being investigated as part of an internal review of the case by Scotland Yard's Directorate of Professional Standards. 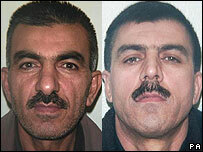 Banaz fled but later went back to her family and tried to carry on her relationship with boyfriend Rahmat Sulemani in secret. Mr Sulemani broke down in tears when giving testimony, saying they had been threatened with death if they carried on seeing each other. He later said: "My life went away when Banaz died. "The only thing which was keeping me going was the moment to see justice being done for Banaz." Banaz was urged to stay at a safe house but told officers she believed she would be safe at home because her mother was there. 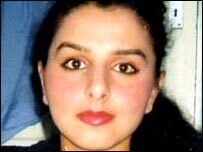 She disappeared on 24 January and her decomposed body was discovered in Handsworth, Birmingham, three months later. Her sister Bekhal, 22, who is in hiding from the family, condemned her relatives for taking Banaz's life. She said: "To do this to their own flesh and blood was unforgivable. Forgiveness isn't even a question. They don't deserve to be on this earth." After the verdict, Detective Inspector Caroline Goode, said: "Clearly there is no honour in killing... I think it is the ultimate betrayal for a parent to kill a child." CPS spokesman Paul Goddard said: "The murder of Banaz Mahmod by her father, uncle and their associates not only took away the life of a young woman, it left her boyfriend in fear of his life and also left other members of the family and the community in fear."